Every so often you hear a story that stops you in your tracks. Mike Rolls has one of those stories. Few people are better positioned to provide inspiring life advice than Mike. At 18 years of age, the tall, affable sportsman was like any other other young footballer. The season had finished and it was time to pack his bags for what should have been a typical footy trip away with the boys. But this season-ending celebration turned out to be anything but when Mike, struck down without warning by one of the world’s deadliest diseases, was given only a 5% chance of survival. Mike was clinging desperately to life. He spent the next 5 weeks unconscious, finally awaking to the devastation wreaked by the deadly Meningococcal Septicemia he’d contracted. Both his legs had been amputated below the knee, and two fingers on his right hand were also gone. Scarring covered much of his body. But the will not only to survive but to prosper shone through, and the story of Mike Rolls’ triumph over adversity began. A keen teenage golfer, Mike’s love of the sport would help him get back on his feet, even though those feet were now artificial. The gutsy performer now has a handicap of 5, better than when he strode the courses on two legs. The most impressive element of Mike’s recovery is his determination to stay positive and always strive to be better. 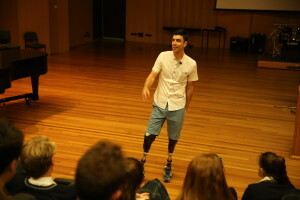 Away from the fairways, Mike spends much of his time as a successful motivational speaker, and is an ambassador for Interplast Australia, a highly-regarded not-for-profit organisation which mobilises surgeons and medical staff to provide free reconstructive surgery for individuals in need in the Asia-Pacific region. He is also a passionate volunteer for the amputee support charity Limbs 4 Life. He recently represented Australia at the World Disabled Golf Championships in Japan. Mike Rolls will leave you entertained, encouraged and inspired!